Fall turkey hunting is a completely different sport than spring turkey hunts. Gobblers are not loaded with testosterone. Fall turkey hunting is more like waterfowl hunting without the water. As a hunter, you need to go where the turkeys want to go. In the fall, turkeys have one thing on their mind, food. If you find the food source, you’ll find the turkeys. Turkeys roam the woods looking for acorns, hickory nuts, and succulent grasses to feed on. See all those leaves your stepping on? Turkeys need to move those out of the way to find food. Look for areas in the forest in which leaves have been pulled back by turkeys. It will basically look like a hole in the carpet. You’re sure to find droppings and feathers in these areas as well. Turkeys like hardwood mast. But they can also be found in open fields, especially on sunny days. Sunshine warms birds, but it also heats up the soil and brings grubs, beetles, and other insects to the surface. Turkeys also feed on spilled grain after harvest. Just last week I spotted a flock of 6 gobblers feeding in a standing corn field. A small section had been trampled down by deer and these turkeys were feeding off what the deer left behind. It’s easy to see field feeding turkeys. The trick is to find the routes they are using to access the field and waiting for them to arrive. Watching birds go up to roost is a common spring tactic. 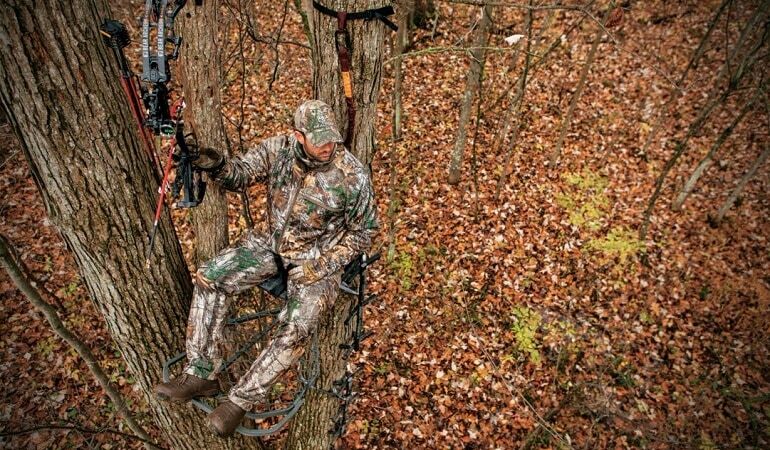 It’s probably more important for fall turkey hunting. If you know where turkeys are roosting and can predict where they are feeding, it’s pretty easy to put yourself in a travel corridor and bag a bird. The big difference between fall roosting and spring roosting is the vocals. You’ll hear a ton of roost gobbling in the morning and the evening in the spring. In the fall, the girls do most of the talking. You’ll hear some kee-keeing and some putt-putting, but that’s about it. Decoys are generally the tools of spring turkey hunters. I will use them about 50% of the time during fall hunts. Normally, I find travel routes and wait for them to come to me. However, decoys can be a real asset for field hunting. Use a decoy that mimics a feeding pattern. A motion feeder is even better. You want the decoy to look like a turkey that is enjoying a meal. In fact, I like using several decoys. Fall turkeys are flocked up in family groups. A small flock of feeding turkeys will look natural and safe. One turkey feeding by itself looks unnatural in the fall. Some hunters don’t call at all in autumn, some call too much. I like to give birds what they are giving me. I’ll start with some slow yelping just too get the attention of nearby birds. Again, turkeys are not generally going to gobble back at you like spring birds will. If you hear anything, it will be a soft purr or cut. Slow things down and mimic the hen talk you are hearing in the woods. Another trick I like is rattling. This is just like rattling a deer. Simply take your free hand and scratch and pound on surrounding leaves. The idea is to sound like a feeding turkey. Fall turkey hunting offers a completely different set of challenges than spring hunting. Gobblers are not as aggressive but birds are generally more patternable than spring turkeys. They are letting their bellies guide them and not that other body part. With some scouting and patience, filling a fall turkey tag can be a lot of fun and very rewarding.